Now Is The Time For You To Know The Truth About How To Keep Flies And Mosquitoes Away. As the summers are approaching fast in the northern hemisphere, it is time that flies will rise from all over. There are simpler ways to get rid of disease and discomfort they cause. We have a few ideas to shoo them away or capture them. Try the method shown and share your experiences. We are of sure some positive outcome. You need to take more than ways to keep them away. 1.Do not leave any ripe fruit or vegetables till they are no more in your premises. 2.Ensure the doors and windows remain closed at all times to control their entry. 3. Spray with all purpose cleaner, all surfaces, underside, floors, cans, and bins. 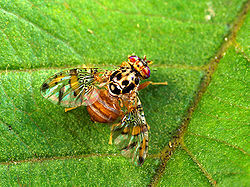 The decaying material of food mainly fruits attracts the fruit flies. The entomologists say that decaying organic matter must be removed, dry the places by using the paper towel. A regular cleaning is a must. Use a fan to evaporate the moisture so that flies and mosquitoes do not land. 4. One way to make the homemade trap for the fruit flies is made by cutting a plastic bottle into two equal pieces horizontally. Insert the neck into the other half. Fill a bottle about 1 inch of apple cider or beer / or wine from the bottom to attract the insects. Add a spoon of honey. Add a gram of yeast. Shake the bottle lightly. Place such bottles at several place in the kitchen and porch and open spaces. The inexpensive insect catcher is ready. You will notice that fruit flies and insects will get eliminated in due course so that you may have barbecues or outdoor party in a flies free zone. 5. You should use other means to stop their multiplication. The female of the species lays between 40 to 50 dozens of eggs around the ripening fruit or sink drains or empty bottles, kitchen trash bins having the discarded material other organic objects. Keep them clean. It is necessary to plan and eliminate breeding places for the egg laying by the females. Ensure to wash and disinfect the bins and clean surfaces of the fruits and vegetables and stores them in the refrigerator. Ensure that no food gets left on the plates or no juice gets left in the cans meant to be the trash. 6.Use incense sticks and burn them in the kitchen and the open spaces, the smell of the sticks will keep insects away. 7. Put fresh basil plants in the kitchen area. The insects cannot stand the smell of the basil leaves and keep away. 8. They also get controlled by smell of cloves, so put them in a porous container and hang at the entry point. They do not like the smell and make no entry. 9. Prick and insert around 20 cloves into an apple that will repel the flies. 10. Insects can be kept away by using a mixture of maple syrup, molasses, and cornmeal and putting them in a bowl. The cornstarch, when sticky will keep them away from the place or the barbecues area. Watch a simple but realistic youtube video to keep insects away. A few classrooms in some schools are willing to try out on pilot projects for the success of this idea and maybe Tennessee State funds this project get released. So how does a plastic bag filled with water drive flies away you may ask? Some have said it magnifies the pennies resembling another insect’s eyes, scaring the fly away, while others say the clear liquid looks like the surface of a body of water, which the flies perceive as a place they don’t want to land. The best explanation is simple light refraction going through the bag of water that confuses the housefly. If you remember your biology from days in school, a housefly has large complex eyes made up of thousands of pure eyes that don’t move or focus. The fly bases his movement by light and the refracted light coming through the water in the plastic bag confuses the fly causing him to move on to a place that is easier on the eyes. And when you have a few thousand to deal with at one time, the easier, the better. At least this is the explanation that some entomologists are giving to this new insect remover now spreading across the Internet and making its way to backyard gatherings. However, others are calling it old wives’ tales and modern superstition. But, if it works, don’t knock it. Maybe come fall we can develop some bags with college logos on them and sell them for tailgating at ballgames. You know, where there is a fly there may be a wave. Flies are not the only insects causing trouble right now either. Mosquitoes are becoming a problem as hot summer temperatures bring more people outdoors to work and play. 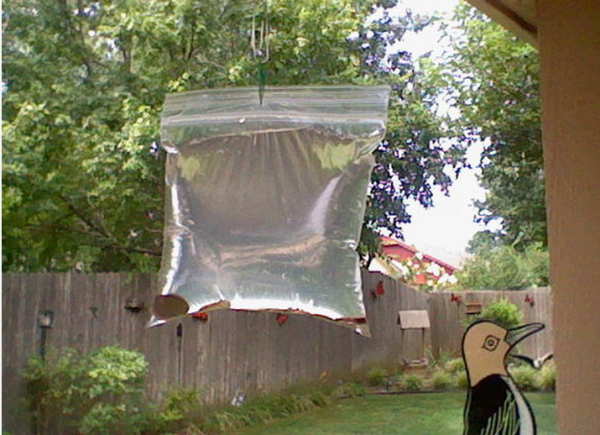 So far, no one has found a plastic bag of water to work on keeping them away so the Tennessee Department of Health is reminding all Tennessee residents to take steps to help prevent illnesses associated with mosquitoes. West Nile is a virus that can be carried by mosquitoes and prevention is the first line of defense. Tennesseans should take precautions to protect themselves from West Nile Virus and other diseases transmitted by mosquito bites. Mosquitoes are most likely to carry WNV bite at dawn and dusk. The best way to prevent WNV infection is to avoid mosquito bites. Here are some tips from the Department of Health that can help. • If you must go outside during dawn and dusk, use insect repellent or wear long sleeves, long pants and socks. • If possible, eliminate standing water near your home. Many containers, even those as small as a bottle cap, can hold enough water for mosquitoes to breed. • Keep windows and doors closed or cover them with screens to prevent mosquitoes from entering your home.